Whip cream with mixer until it forms stiff peaks. 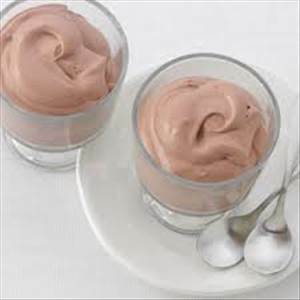 Combine cream cheese, almond butter, vanilla, stevia and cocoa powder in a separate bowl and mix well. Add cream into mixture and blend on medium speed for 1 minute until light and fluffy. There are 258 calories in 1 serving of Chocolate Almond Mousse. Calorie break-down: 85% fat, 9% carbs, 7% protein.